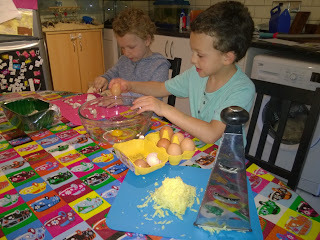 The boys love to cook, and at nearly 6 and nearly 4 they're quite proficient at doing several things for themselves, such as cracking eggs, so this recipe is perfect for them because they can do every element virtually unassisted apart from turning the omelette over in the pan and serving it. For a medium omelette each we use two large eggs per person, cheddar cheese grated (a big handful between 4 omelettes) peas (about a cup for four omelettes) and mushrooms chopped into small chunks (about 8 for four omelettes). Pinch of nutmeg, half a teaspoon of turmeric and anything else we fancy like tarragon also goes into the mix. 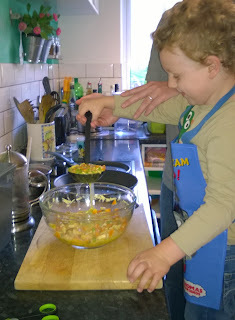 The boys do all the prep, then adult help to put the mix into a hot frying pan. 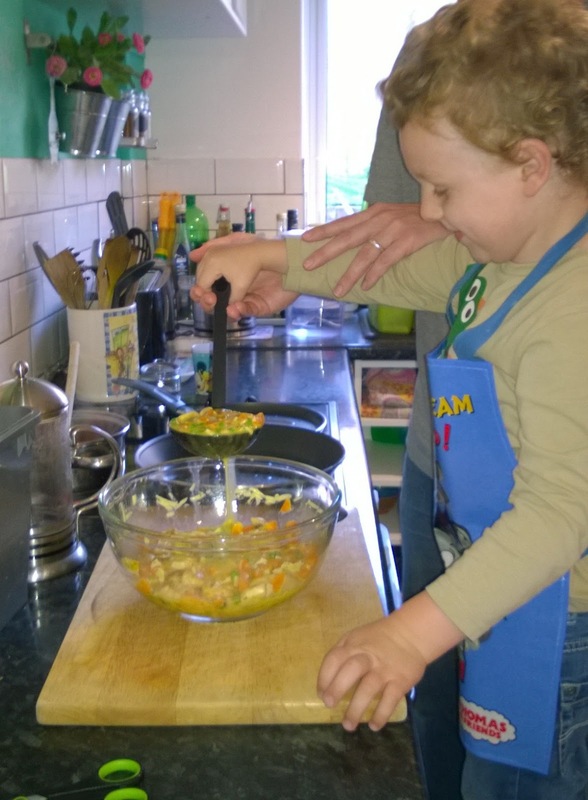 We find using a ladle helpful as it's easy and keeps little hands far away from the pan itself. The adult then cooks the omelette, turning it over to ensure both sides are cooked and serves it up. To complete the activity, the kids like to help set the table and prepare any sides such as salad. Every kid can help with this kind of cooking, given assistance appropriate to their age and abilities. They can adapt the recipe by coming up with new additions to the mix, for example let them smell things from the spice rack and choose what they want to add. You could have a taste test - what's better, cheddar or another type of cheese? 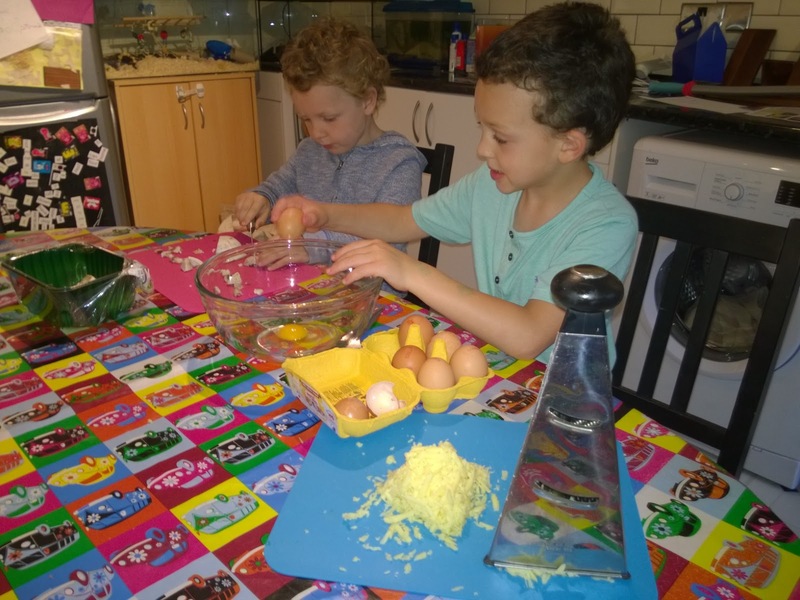 Even the actions of breaking eggs, stirring and chopping are skills which many kids are lacking in our culture where an increasing number can swish a finger on a screen but little else, so never underestimate how important these seemingly basic tasks are for fine and gross motor skills. It's easy enough to make this one dairy free - just leave out the cheese or substitute for non-dairy. Not sure I can veganise this one though as I'm not very familiar with egg substitutes. I'd love to hear suggestions though. Safety bit: usual sensible precautions. Hand washing before and after food prep and make sure surfaces are clean. Discourage kids from eating raw egg if you aren't confident it's free from salmonella etc... or have immune compromised kids. Check eggs cracked into bowl are free from chunks of shell before adding other ingredients. Be vigilant with hot pans and make sure kids know not to try cooking without an adult present. Mushrooms can be cut with a butter knife, making them a good choice for littler cooks.